You work hard throughout the year, way beyond 9-to-5, with inevitably consequences on family life – time together and family holidays in particular are so very precious. With two very young children ourselves and having lived life as professionals in London I hope we understand as well as anyone the pressures the modern family faces. Many of our guests here at The Guesthouse East in Eastbourne head for the coast looking for a holiday escape – the simple family pleasures of fresh air, a stroll along the pier and a frolic on the beach. Some specifically head to us based on word-of-mouth from friends and family who have stayed here and recognise the advantage of the large, flexible suites with self catering kitchens and the free availability of travel cots, sterilisers, high chairs and even the books and toys we can lend. Not to mention the independent baby-sitting service provided by local nursery staff. We actively recommend some great family friendly cafes and restaurants who completely recognise the changing dynamics of Eastbourne and demand for good-quality, reasonably price fayre, who aren’t simply child-tolerent but actually child-friendly. From my experience the two terms are poles apart…. Try Central Eating Cafe on Terminus Road for cracking cakes, coffee and a mushroom burger to die for. Pomodoro is a lovely family-run Italian, again just a couple of minutes walk from here – we have discount vouchers for both. 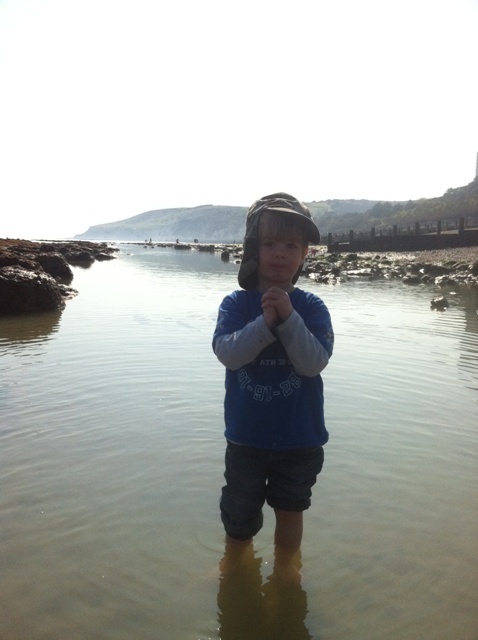 We have a largely pebble beach in Eastbourne, but come low-tide enough sand is exposed to create a sandcastle or two and if you time it right, the rockpools, from the Grand Hotel down to Holywell, will keep the children entertained for hours. Thanks to the micro-climate created by the South Downs Eastbourne enjoys more sunshine than any other place in the UK, but even here we do occasionally get the odd drop of rain – thankfully there is a cinema at the bottom of the road and the Sovereign Centre provides a wonderful swimming pool, complete with a gentle slope into the water, slide and wave machine. All at a council-run price. I haven’t even got close here to talking about Drusillas, Blackberry Farm or the Miniature Steam Railway but each are worth a visit and I’d be delighted to offer more information on them. Feel free to drop me an email, make comments on blog or call on 01323 722774 if you would like more details on things to do – we can even help shape itineraries for your stay. As for me, it’s more blackberry-picking with the kids this afternoon for a tasty crumble this evening!